Reviewed by Ana Peraica, December 2017. “Since Douglas Crimp’s canonical book, On the Museum’s Ruins, a discourse contrasting two different cultures has arisen. These are ones of the museum and one of the archives, commonly distinguished on the level of exclusivity and inclusivity, and are one of the centres of debates in humanist studies of collections. 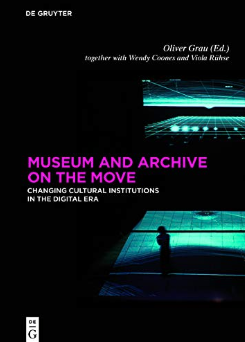 Museum and Archive on the Move, edited a team of recognized Media Art History scholars from the University of Danube––Oliver Grau, Wendy Coones and Viola Rühse––published by Walter De Gruyter, is a new reading of this area. This volume, in overlapping fields of museum and archive studies, introduces emerging questions of media art in terms of its rare and very often unsuccessful preservation. Eminent media theorists, including Sean Cubitt, Erkki Huhtamo, Ryszard W. Kluszczyński, or curators such as Documenta XI curator Okwui Enwezor and Transmediale director Andreas Broeckmann, contribute to this crucial theme. The introductory essay (by Jorge Wagensberg) overviews the theme of a museum of art and science, followed by Viola Rühse’s essay pointing to the digital collection of Rijksmuseum whose decade-long restoration saw the opportunity to rise a large online digital collection. Dieter Bogner’s text focuses on museum planning and exhibition dynamics, usually not visible from common museum discourse, starting with narratology and audience [reception] theories. Goner uncovers various factors, often not taken into account by architects, such as ventilation, the position of speakers, size of the area behind interface, etc. Erkki Huhtamo, from the position of “exhibition anthropology,” is pointing to the growing need, but also consequences of, interactive material in museums, in which a sense of touch is questioned, arriving to the interesting concept of “tactiloclasm”. To counter this, Huhtamo is advocating “tactical transgression.” Besides the touch prohibition inside the museum, he is also analysing the expansion of museum via different apps (as Museum of London’s Streetmuseum) in mixed reality, and their role as cultural industries in shaping quality of visitor experience. Ryszard W. Kluszczyński analyses the position of linear (narrative) and non-linear (interactive) art in contemporary museum displays. Since the “process of videofication” in the 70s and interaction in contemporary age, masking differences in cinema (and creating something as museum/cinema), where the difference from expanded cinema to interactive film seems to be illustrative of the second shift. Kluszczyński also provides definitions and conceptual criteria for mapping/analysing different types of interactive films. Next is Digital Art’s Complex Expression and Its Impact on Archives and Humanities, by one of three editors of this reader, Oliver Grau. Grau warns on the total loss of media art due to fast technological and media changes and a lack of interest of museum context, offering the solution in databases and platforms that serve for preserving information on such art (such as Archive of Digital Arts – ADA expanded in Interactive Archive and Meta-Thesaurus for Media Art Research – AT.MAR), Youngjin Lee continues with archive and research practice in Asia, while Okwui Enwezor focuses on Gaba’s Museum of Contemporary African Art. Enwezor analyses African a-museum positions, being outside of the discourse of the museum at all (not anti as – being opposed to, but rather – being completely outside of the discourse). This enforces the idea of archives that better describes non-narrative cultures, based on dynamic/oral, rather than fixed written histories. Wendy Coones’ essay on scientific and non-scientific approach to Mars (including different archives) functions as reductio ad absurdum of museum logic shaken already by previous essays, showing how any data collection (as Mars, in this case study) can behave as a museum, providing different objects and information for interpretation.